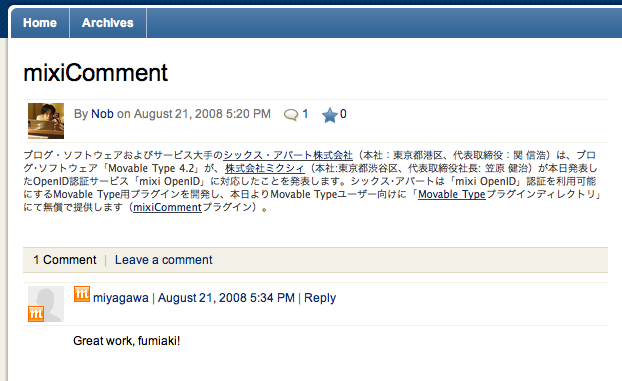 Posted August 22, 2008, in Plugins. As we started to show with Movable Type Pro last week, blogging is evolving to encompass the world of social networking and connect to the rest of the web; merging publishing with community. Since the release of Movable Type 4.0 last year, we've built in native support for technologies like OpenID and now OAuth, to make it even easier for people to bring parts of their profile with them when they come to your blog. Last month we demoed integration of Facebook Connect with Movable Type which continues to make this vision a reality, though it isn't enough to integrate with just one social network. mixi is Japan's most popular social network (one in five Japanese web users use mixi) and earlier this week they launched support for OpenID. Six Apart's Japan team participated in this launch and we are now shipping a plugin to make it easy for mixi users to interact with Movable Type powered communities. The mixiComment plugin brings the community of mixi to your site, giving commenters an even better experience by signing in using their mixi OpenID. Even better, the user interface takes advantage of new features in OpenID 2.0 so that normal people don't even need to know what OpenID is; instead just click a button to login with their mixi account. Just like Facebook Connect, this makes it easier for a wide range of people to participate on your site by being less work for them to sign in while allowing them to bring pieces of their profile with them all over the web. You can download the mixiComment plugin from our plugin directory and easily add support for the largest social network in Japan to your blog. Are the comments from Mixi do follow or they are like in Facebook – no follow? Is mixi only in Japanese or they have English speaking users too? The plugin is made by Fumiaki Yoshimatsu which means it is a great piece of job. Who needs a connection with mixi can use it without any doubt. Mixi is a great option for bringing in readers. I have read somewhere about a research which showed that is far more possible that a Japanese reader to put your feed in the reader than any other user on the world. To sign in with my social network profile is not always a bright idea. Many user (me also) would not do this. How can I turn off this feature? Where is the point some links in English written page to point to Japanese written page. I can’t read them. I think is obvious.